It's fall...and that means it's time to start thinking about spring. 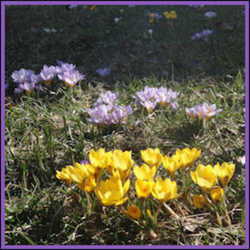 Or at least spring bulbs. 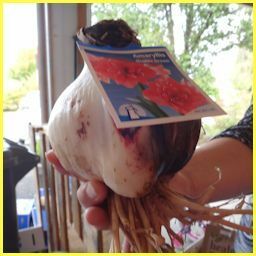 If you have some friends who also want spring blooms, you can combine your bulb order and get bulk discounts. You’ve taken the bit in your teeth and organized a group buy, securing savings on fall bulbs for yourself and your fellow gardeners. Next come delivery, sorting, and distribution of the bulbs. Before the actual delivery hits you like a ton of, well, bulbs, get some things out of the way. With a pre-season bulb purchase, take advantage of having several months before the delivery date to get organized, a step at a time. Don’t procrastinate, unless you thrive on stress, and not even then. Once you’ve finalized your order with the vendor, you can send out “final” invoices. If you use Google or another accessible spreadsheet, you’ll still avoid confusion by sending everybody at least a quick Dmail with their total. Let people know when and how to pay. Keep track of payments carefully, especially cash and checks. If you do everything via PayPal, it’s easy to double-check amounts and verify payments. Double check your spreadsheet numbers against the order receipt or invoice from your supplier. Sometimes it takes a little back & forth communication to get all the order details right. Be especially alert if you’ve made any changes or additions. Make sure your delivery date is clear, also. 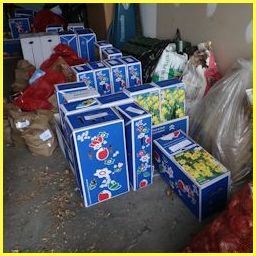 I get bulbs delivered a week before our “Bulb Sorting Party” dates, giving friends time to come over and help me sort. Usually, we only have a few bulbs left to sort out before we start pulling orders on Party Day. “I’ll do it myself,” said the Little Red Hen, and why she didn’t go insane I don’t know. When you’re doing a group buy, by definition you should not be alone in the effort! Recruit assistance with the spreadsheet, labels, invoices, sorting or other tasks. If you’ll be packing and shipping bulbs, be sure to have reliable help lined up! I keep our bulb buys relatively small by limiting participation to local DGers who can come to a “pickup party” at my house. I know I'll have help with sorting bulbs and pulling orders. And I won’t have to ship out boxes. 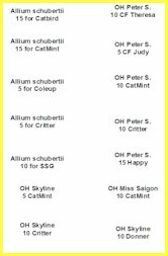 The best method I’ve found for splitting up a bulk purchase is to make up labels ahead of time. An address label template works well, even if you’re just printing slips rather than sticky labels. For each variety, go down your spreadsheet and make labels with the variety name, the person’s name, and the number of bulbs they’re getting. Making labels gives you a chance to double-check your numbers. If you’ve ordered a bag of 150 bulbs, but you only have labels for 2 bags of 50 and 1 bag of 25, it’s time to see who is getting (and paying for) those last 25 bulbs. Print labels before bulbs arrive. Cut labels apart just enough to separate varieties into baggies, so they don't fly around the garage. 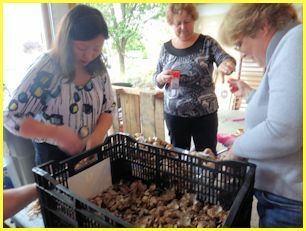 With our big fall bulb buy last year, people who couldn’t be at the “pickup party” came earlier in the week to help out. 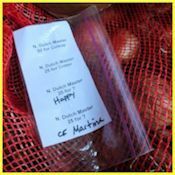 We also had some people whose bulbs were picked up and delivered by another participant, known as their “bulb fairy,” or maybe “bulb ferry.” Everything worked out really well, thanks to the cooperative spirit of our local DGers! “Shock and awe” sums up my response to having bulbs delivered by an 18-wheeler. Dividing all those bulk bags seems like an impossible task when you’re staring at a huge pallet of crates and boxes. But it’s like the cliché about eating an elephant, just take it one box at a time. Arrange the boxes in a way that makes sense to you, checking them against the delivery invoice as you unpack the shipment. Organizing your boxes the same way as your spreadsheet makes it easy to print packing slips and pull bulbs for each person. I put all the daffodils along one side of the garage, in alphabetical order by variety. 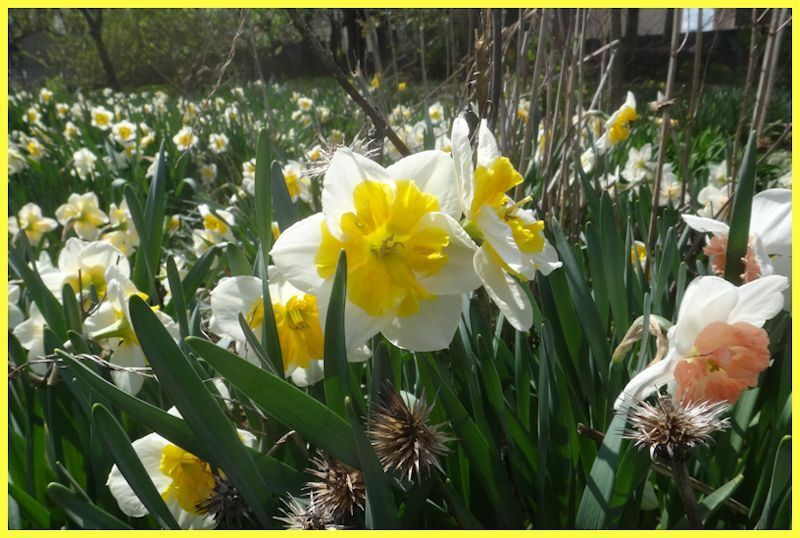 The non-daffodils went on the other side, also alphabetically. 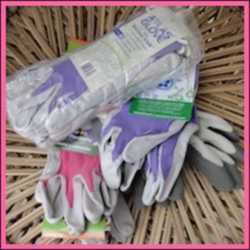 Place the labels (still in their baggie) with each corresponding box or bag of bulbs. Unless you have just a few varieties, divide the bulk bags ahead of time. At the pick-up or packing party, pulling orders will keep everybody plenty busy! It’s tempting to just give everybody their invoice and let them go along the row of boxes, taking 5 of this and 25 of that for their order. Don’t do it! Almost certainly, the numbers won’t come out even, and then you’ll have a big mess trying to sort it out. There’s enough potential for confusion with a big group buy; using a label system will help keep you sane. Set up your work table. You’ll want paper lunch bags, a few larger paper grocery bags, packing tape or staples, scissors, and a pen (somehow, I always need a pen). Open boxes or bags ONE AT A TIME! That way, all the bulbs on the table will be of the same type & variety. Those pre-printed labels make it easy to divide the bulbs into piles of however many for each person. Once you know the counts work out, it’s time to bag and label the bulbs. 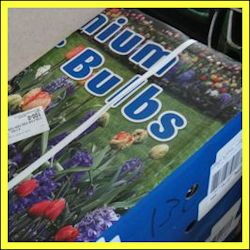 If the vendor sent plastic plant labels, don’t forget to put a few in with the bulbs. 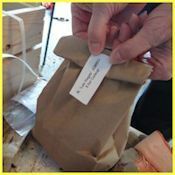 A strip of packing tape works to both attach the paper label and seal the folded-over top of each bag. Two people working at a table seems just right. Both people start by dividing the bulbs into piles of 5, or 25, or whatever multiple you used. It’s much easier to recount bulbs in piles rather than trying to find a missing bulb once they’re in separate bags. Put any moldy or squishy bulbs to the side as you go along. Often, vendors try to over-pack bulk boxes to make up for a bad or missing bulb or two. If not, make adjustments and ask the vendor for a refund (this is where the pen comes in handy). Then one person counts bulbs into bags while the other closes each bag and tapes or staples it shut with its label. 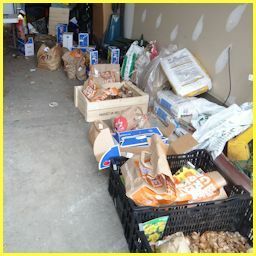 Once sorted out, the pile of bags goes to back to the designated spot for that variety. Pickup can be on the same day as packing for smaller group buys. For really large orders, spread out the work! You’ll want packing lists for the pick-up party or for boxing mail orders. If you arrange your spreadsheet, your lists, and your bulbs in the same order, packing will be fairly straightforward. The host is the traffic cop during packing, trying to keep people moving along down the row of varieties, pulling and packing orders. One person jumping around because their list is out of order can throw everybody into a tizzy. Once people start driving off with their bulbs, errors are nearly impossible to track down, so ask everybody to please please please check items off their lists as they pull them. Double check to be sure orders are complete. If people are paying you at pick-up, check payments off on a list, and make a note of cash amounts. In all the excitement, it’s easy for either you or others to forget something. Now it’s time to celebrate with your friends and imagine how wonderful your gardens will look next spring!